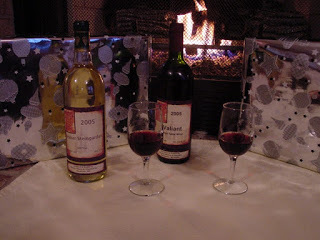 It’s time to explore the Phoenix Winery one of the Missouri wineries to visit while staying at our Hermann, MO bed and breakfast. Meet Guenther Heeb, owner of the Phoenix Winery and chef extraordinaire. Guenther was born and raised in Germany at a 200 year old winery near the Rhine River. He and his American born wife moved from Germany to the United States 35 years ago and worked as an engineer until the year 2000 when they decided to start a vineyard. Growing the grapes was as far as he intended to go but now he makes wonderful wines on 10 acres. Phoenix Winery is a small, boutique winery where he tries to maintain the German style of winemaking. He sells all the wine at the winery, nothing wholesale. If he sells out that’s it until the next harvest. Guenther also operates the Edelweiss Dining Club, a private membership only eating club, where he is the chef. This is where he has a great time pairing his wines with his food. Phoenix Winery is located at 1840 Hwy. 50, about 21 miles south of Hermann. It is open year round from 9 to dusk Monday through Saturday. Hours begin at 11 on Sunday. To contact the winery, call 573-437-6278. Put this winery on your “to do” list while visiting our Missouri bed and breakfast.